This is an ORIGINAL Photograph measuring 8" x 10" of former teen hearthrob,JAN MICHAEL VINCENTThis photo shows the actor in a composite Photo image from a film, SHADOW OF THE HAWK. 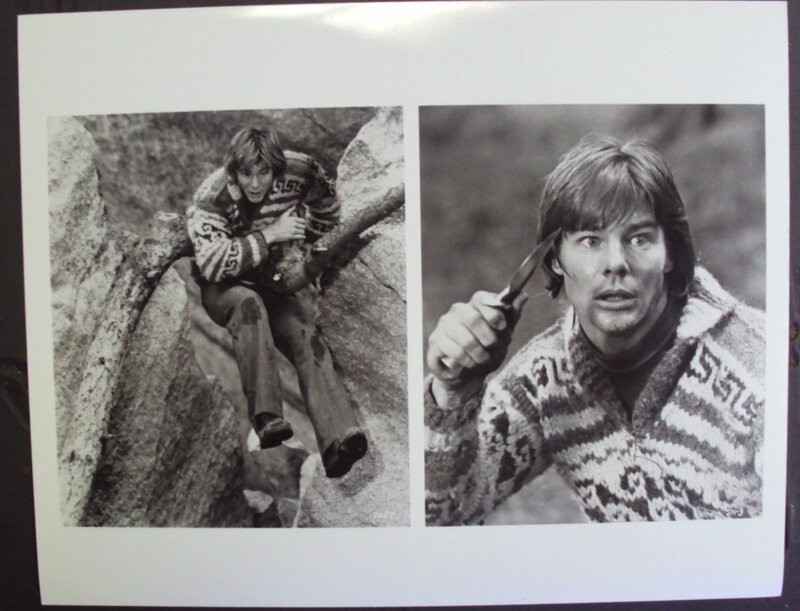 It's written on the back, and it's a great action photo composite of the actor!MORE INFO ON AIRWOLF star, JAN MICHAEL VINCENT: Virile, handsome and square-jawed youthful star of the 1970s and 1980s whose early potential at super-stardom fizzled out. Jan-Michael Vincent originally made a name for himself portraying rebellious young men bucking the system, as in Tribes (1970) (TV), White Line Fever (1975) and Baby Blue Marine (1976) or as a man of action on either side of the law, as in The Mechanic (1972), Vigilante Force (1976) and "The Winds of War" (1983).He was born in Denver, Colorado, in July 1944, and was finishing a stint in the National Guard when a talent scout was struck by his all-American looks. He made his first appearance on-screen in The Mystery of the Chinese Junk (1967), before appearing in Journey to Shiloh (1968) and in "Danger Island" on the Hanna-Barbera kids TV show "The Banana Splits Adventure Hour" (1968). He remained very busy during the 1970s, appearing in high-profile productions alongside such stars as John Wayne, Rock Hudson, Charles Bronson, Slim Pickens and Robert Mitchum.In 1984 Vincent landed the role of Stringfellow Hawke in the helicopter action series "Airwolf" (1984), co-starring Ernest Borgnine. The show wrapped after three seasons and from then on he was primarily appearing in low-budget, B-grade action and sci-fi films, including Alienator (1990), The Divine Enforcer (1992), Deadly Heroes (1993) and Lethal Orbit (1996) (TV). His last film to date was the woeful gang movie White Boy (2002), and ongoing health issues and personal problems seem to preclude his return to the screen.Vincent will be best remembered by film fans as a smirking, apprentice hit man to Charles Bronson in The Mechanic (1972), as feisty "Matt" in the superb surf movie Big Wednesday (1978) with Gary Busey and William Katt, or as rebel trucker Carol Jo Hummer battling corruption in White Line Fever (1975).Winnning buyder agrees in advance to pay an additional Mail postage (Foreign orders will require additional postage) and to remit full payment within 10 days after notification from the seller.PLEASE ALLOW 10 TO 14 DAYS DELIVERY. California residents must add - state sales taxes. Be sure to click on "View Seller's Other products" for more great items like this!Powered by eCRATER . List your items fast and easy and manage your active items. JEAN HARLOW Original SUZY Photo MGM Cary Grant M.G.M.